After last week’s selection I have been hard-pressed to find an exceptional example of siding to showcase this week. Until yesterday, that is. 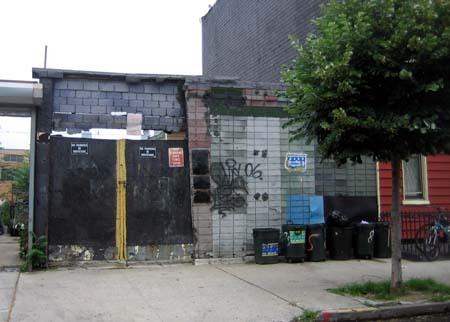 Before vinyl and aluminum siding became the benchmark in Greenpoint there was asphalt siding. There is still plenty of it to be found too. The above Fred T. Sanford-esque “wall” alone employs at least five types of vintage siding for your viewing pleasure. If you think the sight of this is ugly (and I for one don’t), wait until you see what has gone up across the street. 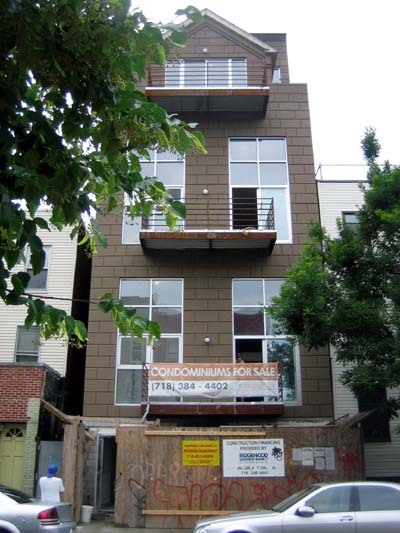 I am going to go out on a limb here and make a prediction: fugtastic and cheap-looking Neoclassical condos are going to be the “vinyl siding” of the future. Miss Heather: May I nominate Lorimer St. between Meserole and Graham, south side of the street? That block would have been so beautiful. I will have to look into this. Thanks for the tip! haha. this brown beauty is my lovely view.